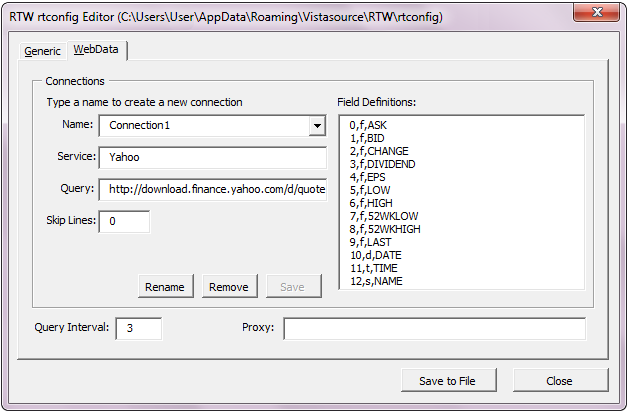 By default, the RTW WebData engine is configured to access data from the finance.yahoo.com website. No additional configuration is required to try this engine. This section provides information about editing the RTW WebData engine configuration options using the RTW rtconfig Editor. The options are located under the WebData tab of the Rtconfig Editor dialog, and correspond to those found in the rtconfig file located in the installation directory. To manually edit the RTW WebData engine configuration options in the rtconfig file, see Manually Editing the rtconfig File. To edit the RTW WebData rtconfig settings, select Vistasource → Settings → Rtconfig Editor and then select the WebData tab. Name the connection, e.g. Connection 1. Enter the Service, e.g. Yahoo. Enter a URL query to request a CSV (comma-separated values) file of stock data, e.g. whereby %s is a placeholder for the stock symbol. Enter the number of lines that the engine should skip in the incoming data file before starting to parse data. The default is 0 (zero). Enter the field definitions for each available field. The format is: number, type, name. The type must be one of the following: f for float, i for integer, s for string, d for date, or t for time. (e.g. 0,f,ASK)\\Note: These definitions will vary from service to service, e.g. the field definitions for Yahoo (US) are different from the definitions for YahooUK and YahooGermany. Save the connection by selecting Save. To remove a connection, select Remove. The query interval is the length of time the RTW WebData engine waits before making any queries. The default is 15 seconds. This value must be set if you have a web proxy. Enter the proxy URL, including the port number and trailing slash.